If you are new to Mailman list management, this page is for you. It outlines those things you should know in order to get started. Mailman is a resource provided and operated with Washington State funds and its use is governed by federal and state laws and policies, as well as University of Washington policies. You may establish and use Mailman lists only for activities related to UW research, education, or administration. Mailman lists may be established for UW students, faculty, or staff who need a list to further their work at the University. Staff ownership and use of Mailman lists is subject to the approval of their departments and supervisors. All Mailman lists must have at least one owner who is a current UW student, faculty, or staff. Additional owners do not have to be affiliated with the UW, however, all Mailman list owners must have a valid UW NetID. Send email to help@uw.edu for information on how to sponsor a UW NetID for non-UW owners. Any list without a current UW student, faculty, or staff owner will be removed from the server by the system administrator. Mailman lists that are not used for a period of two years will be removed from the server. Mailman class lists are removed after one year, regardless of activity. Limiting the number of email messages in a 24-hour period to 2,000. Email lists are intended for discussions and announcements created and sent by humans, not alerts generated by computers. Using a mail list to send system-generated messages can quickly lead to volume issues (see last bullet point above). Please ensure that you are using your Mailman lists to send only messages created by people, not machines. These procedures are important because they help keep email flowing smoothly and keep the UW from being blacklisted as a source of spam. If list owners do not follow these procedures, they risk having their list disabled. UW Information Technology will issue advance warning to list owners before disabling the list. However, if a list is not properly maintained and causes the UW to be blacklisted, the list will be disabled immediately. See Appropriate use guidelines for more information on usage policies. To start a Mailman list, fill out the Standard Mailman List Request form. Mailman lists may take up to two business days to be created, and Instructor Class Lists take an additional day to have the students automatically subscribed. Note: Internet Explorer versions 9 and earlier are not supported; instead of using the form, email your list request to help@uw.edu. It is recommended that instructors use the My Class Resources section in MyUW to request class lists when the desired class list is available to them. These class lists are created at the time they are requested and will be ready to use the following day. For cross-listed courses or combinations of courses where the instructor wants a single list and cannot request one through MyUW, you can submit a request for an Instructor Class List by filling out the Class Mailman List Request form. Click on the “log in” link to log in with your UW NetID and password. Once you are logged on to the administration site for your list, you should see the Configuration Categories at the top of the page. There are also some sub-categories for Membership Management and Privacy Options that can be accessed when you enter each of those categories. Browse through each of the available configuration screens to become familiar with the configuration options. Click on each option for more information. The List Configuration Options page gives you additional information. Feel free to email help@uw.edu if you have any questions. Once you have familiarized yourself with your list’s configuration and options, you will want to set up an info file, welcome message, and goodbye message. All of these options can be found in the General Options section of the administration pages. The welcome message will be added to the generic welcome message from Mailman and will be sent to all new subscribers if you choose that option. See the welcome_msg and send_welcome_msg settings. The goodbye message is similar to the welcome message except that, as its name implies, it is sent to subscribers who are leaving the list. See the goodbye_msg and send_goodbye_msg settings. When you establish a Mailman list, you are not automatically added as a subscriber. This means that you must subscribe yourself if you want to receive messages that are posted to the list. To add yourself to your list, go to the Membership Management section of your list’s administration pages and choose the Mass Subscription category. Now is a good time to test your welcome message so make sure that the “Send welcome messages to new subscribers” option is marked “Yes” and put your address in the box. If you are just subscribing yourself, you probably don’t need to send a notification of the new subscription to the list owner so you can mark that option “No”. When finished, don’t forget to click on the “Submit Your Changes” button. Of course, you do not need to subscribe yourself to your list if you do not want to. Keep in mind, however, that some lists are configured to only allow subscribers to post messages. If you are an owner of such a list and do not subscribe yourself, your posts will not be accepted by the list. As you might imagine, mailing lists need subscribers to be worthwhile. How you get them will depend on what your list is for. If it is for a class or small group of people, then you can probably tell people about the list in class, email them, or even add them yourself. Learning how to add subscribers is easy. If your list is intended for a larger body of subscribers, you might want to post information about your list to a Usenet newsgroup, or mention it on a Web page. To learn how to deal with these issues, click on the related links. These subjects, as well as others, are all covered in Maintaining a Mailman List. And if all else fails, you can send email to help@uw.edu as a last resort. Each list must have an owner who is responsible for configuration, maintenance, and operation of the list. The list owner may establish other owners, and may optionally have others take roles such as moderating the discussion or managing subscription requests. List owners can execute commands for their subscribers, including adding and deleting subscribers. List owners receive all requests for moderation from the server that moderators receive, so even with a moderated list, it is not necessary to specify a moderator. Each list must have at least one owner who is a current student, faculty, or staff at the University of Washington. List moderators are optional. They are assigned by the owners and can manage list subscriptions and postings. Moderators do not have access to the administration pages and cannot make changes to configuration settings. The list moderator, however, has two options for authentication. If the moderator is listed with his @u.washington.edu address, he should use the “log in” link on the moderator page to log in with his UW NetID and password (the same way the list owner does above). If the moderator is listed with a non-UW address (or a departmental UW address), a moderator password must be set by the list owner and that password should be entered into the List Moderator Password box (shown below) on the moderation page. After entering the password, click on the “Let me in…” button. For information about how to specify a list moderator, assign a moderator password, and configure your list as a moderated list, see the Managing Private and Moderated Lists section below. If you do not keep this email message or can’t remember the URL, just follow the steps below. After you log in to your list administration page, you will see a number of Configuration Categories links at the top of the page. You can follow each link to access all of your list settings. For more information on the available settings, see the List Configuration Options page. Mailman can place a limit on the size of a message that it accepts for list postings. The owner can change the limit to try to restrict or allow attachments to be sent to the list. (where listname is replaced with the actual name of your list) with your UW NetID. Near the bottom, locate the “Maximum length in Kb of a message body” field. Change the limit to something suitable, or enter “0” for the maximum server limit of 10 MB. When finished, click the “Submit your changes” button. Your changes are now in effect. Note: If you have a message that is larger than 10 MB, you will not be able to send it to your list. We recommend breaking up the attachment into multiple smaller attachments and sending them separately or posting the attachment on a Web page and sending only the URL to the list. Go to the General Options configuration category and specify a moderator address. 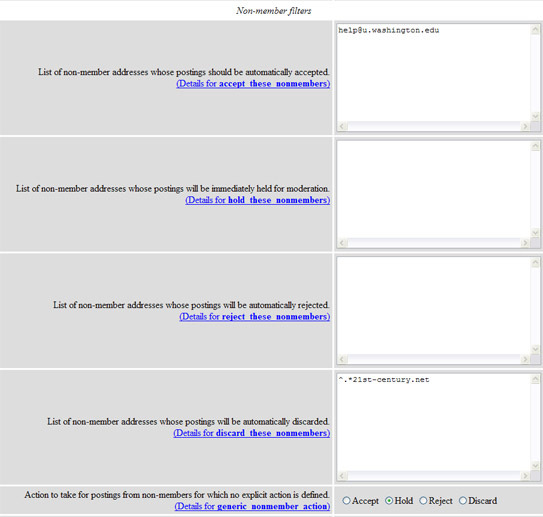 If adding more than one moderator, type each address on a separate line. When finished, submit your changes at the bottom of the screen. If your moderator does not have an @u.washington.edu email address, go to the Passwords configuration category and assign a moderator password. Note: If your moderator does have an @u.washington.edu email address, he will be able to log in to the moderation page with his UW NetID and password. Go to the Privacy options configuration category. To require approval to subscribe, set the subscribe_policy setting to “Require approval” or “Confirm and approve” (the latter requires that subscribers using non-@u.washington.edu addresses confirm their subscription once you have approved it). To require approval to unsubscribe, set the unsubscribe_policy setting to “Yes”. Note: It is not recommended to require approval for unsubscribing. When finished, click on the “Submit Your Changes” button. Go to the Sender filters configuration category under Privacy options. Set the default_member_moderation setting to “Yes” and select the desired moderation action in the member_moderation_action setting. This will affect future subscribers. To update moderation settings for current subscribers, go to Step 4. Note: There are also settings for messages coming from non-member addresses. You can choose to automatically accept, hold, reject or discard messages from all non-member addresses by setting the generic_nonmember_action setting. You can also add specific non-member addresses or domains to the accept_these_nonmembers, hold_these_nonmembers, reject_these_nonmembers and discard_these_nonmembers settings. To update moderation settings for current members, go to your Membership Management page. When finished, click the “Submit Your Changes” button.Note: If your list has been set up as a moderated list, only those messages you approve are delivered to list members. Whenever a new message arrives for a moderated list, a notice is sent to the list owner and the list moderator (if there is one). You can control when you receive the moderation notification (immediately or once daily) by setting the admin_immed_notify setting in the General Options configuration category. Owners and moderators using their @u.washington.edu address should follow the log in link to log in with their UW NetID and password. Moderators not using an @u.washington.edu email address should enter their moderator password in the box provided and click on the “Let me in…” button. View the summary list of subscription requests, unsubscribe requests, and postings being held for approval. Follow the “More detailed instructions” link towards the top of the page for an explanation of each option (i.e., Defer, Accept, Preserve, etc. 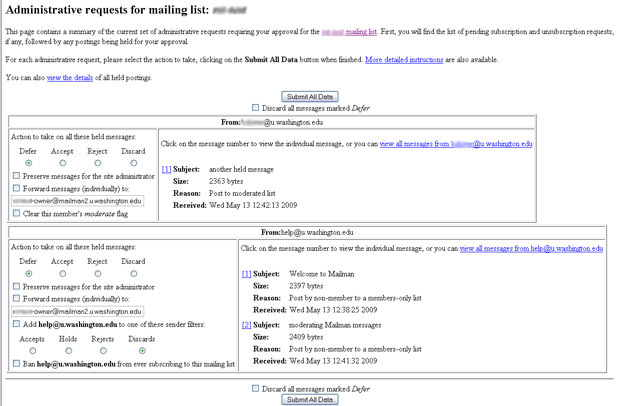 ).You can click on the “view the details” link to view the message body of all of the held messages; use the “view all messages from…” link to view the message body of all messages sent from a single address; or use the numbered links next to each Subject line to view individual messages. Each of those screens will allow you to act on the pending requests. After you have acted on all of the pending requests, click on the “Submit All Data” button. Email messages from owners and moderators are treated the same as all other messages for the list. For more information about giving owners and/or moderators permission to post to the list, see the “Why are messages from the list owner moderated?” in the Mailman FAQ. If messages are being held for moderation and you don’t understand why, see the “Why am I getting moderation requests for my unmoderated list? in the Mailman FAQ. The email address of the subscriber whose email is bouncing. The severity of the problem causing the bounce. If no email address for the subscriber can be extracted from the bounce, then the bounce is usually discarded. The severity of the problem can be labeled as either hard (meaning a fatal error) or soft (meaning a temporary error occurred). When in doubt, a hard severity is assigned. Each subscriber is assigned a bounce score and every time Mailman encounters a bounce from this member, the score goes up. Hard bounces increase the score by 1, while soft bounces increase the score by 0.5. However, bounce scores are only increased once per day so even if ten hard bounces are received for the same subscriber in one day, that subscriber’s score will increase by only 1 for that day. Score threshold: For each list, the list owner can set a bounce score threshold. When a member’s bounce score exceeds the list’s bounce score threshold, the subscriber’s subscription is automatically disabled. Once disabled, the subscriber will not receive any postings from the list until their membership is explicitly re-enabled (either by them or the list owner). However, they will receive occasional reminders that their membership has been disabled, with information about how to re-enable it. Reminders: The list owner can control both the number of reminders the subscribers will receive and the frequency with which the reminders are sent. Info stale: After a certain period of time during which no bounces from the subscriber’s address are received, the bounce information is considered stale and discarded. Note: By adjusting the “bounce_score_threshold” and “bounce_info_stale_after” setting, you can control how quickly members with bouncing email are disabled. You should set both of these to the frequency and traffic volume of your list. When finished, click the “Submit Your Changes” button. followed by an email address. If you find such a line, you’re in luck. Now you know whose email is bouncing and you may even know why (it will sometimes say the reason right after the email address). View a list of your current subscribers as well as their mail options. Click on the “Click here to include the legend for this table” link just above the table of members to view more information about the different mail options.Note: If there are 30 or more addresses subscribed to your list, Mailman will display them alphabetically on separate pages. To view them all on a single page, scroll down to the Additional Member Tasks section on the Membership List page. Increase the number in the Set a threshold of the number of members before split up alphabetically setting and click the Set button. Go to the Membership Management section. Select the option of subscribing addresses or inviting them to subscribe. Subscribing them will add them to the list immediately. Inviting them to subscribe will send them an email message and they will have to confirm that they want to be added to the list. Choose whether or not to send a Welcome message to the addresses that you are adding. Choose whether or not to send notifications of new subscriptions to the list owner. Joe User <joeuser@u.washington.edu>You can also choose to upload a file that contains your subscribers. The file must be plain text. The names and email addresses should be in the same format specified above. Do not upload a Word or Excel file. It is also not a good idea to copy and paste addresses from Word or Excel into the subscription box as this often results in hidden space characters being included at the end of the address, causing the email address to be invalid. If you want to include additional text to be added to the top of your invitation or the subscription notification (welcome message), include it in the box provided. The text will be added above any custom text specified in the welcome_msg setting under General Options. Click in the box in the first column (the “unsub” column) next to the address of each subscriber you want to delete. Go to the Membership Management section and then to the sub-category Mass Removal. Choose whether or not to send acknowledgement of the removal to the user being removed. Choose whether or not to send a notification of the removal to the list owner. Enter the email addresses you want to remove (one per line) in the box. Do not include names with the email addresses. 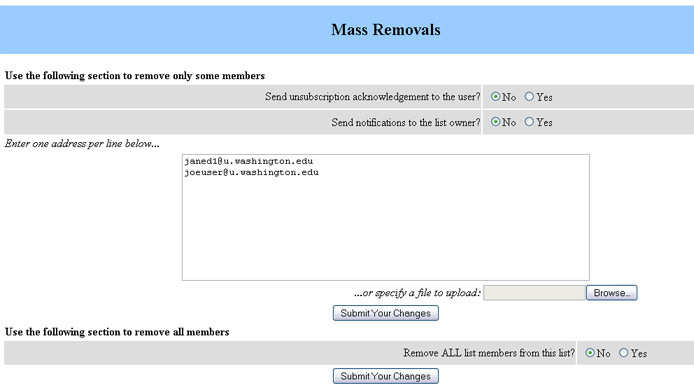 Note: If you wish to remove all subscribers from your list, there is that option on the Mass Removal page. That option only works if you choose not to notify the users and owners. Post a statement of appropriate use and conduct to the list. If the offending user is a UW student, faculty, or staff, report the inappropriate use to UW Information Technology by sending an email message to help@uw.edu describing the situation and including samples of the offending messages. Unethical use of University computing resources can be grounds for disciplinary action, including loss of computer accounts. Add the person’s email address to the list of addresses which are banned from membership on your list. From the list of configuration categories, select Privacy Options. This will default to the Subscription Rules sub-category. Add the offending user’s email address to the ban_list setting. You may also wish to review the Mailman owner and usage Policy section (above) and Etiquette Guidelines for Posting Messages. Under General Options, you will see an owner setting where all of the current owners are listed. If you decide that you no longer need your Mailman list, fill out the Mailman List Deletion Request Form or send email to help@uw.edu and ask to have the list deleted. Mailman performs lots of functions in addition to distributing messages to subscribers. It allows you to do a task, like subscribing to a list or changing how a list works, by going to a specific Web address. when there are subscription requests or messages to be moderated. List owners should use their UW NetID and password to authenticate to the administration and moderation pages. Each of those pages will have a “log in” link to allow access via UW NetID. There is an optional Moderator Password that can be set by the list owner for moderators who do not have a UW NetID. You can find more information about list configuration options on the List Configuration Options page. If you are looking for more information about using regular expressions with Mailman, see the Regular Expressions in Mailman page.